Summer is here and that means some of us are finally getting outside for the first time in months. RunKeeper is at the top of most ‘best running app’ lists for a reason: it’s the best running app available for Android today. RunKeeper is a feature-rich running app that lets you add friends, add routes, add music, and map your runs every day. You can also do interval workouts and see how many kilometers you run every week. Like most running apps, you get all the vital run information – miles covered, number of runs taken, calories burned, etc. All of this info is saved to your profile and consistently tracked over time. RunKeeper and Nike+ Running are very similar. Both apps have copied features from one another and you can’t go wrong with either. Still can’t decide? Download both apps and see which one your friends use most. Running is more fun when you can see how much faster you are compared to your friends. I already talked about Nike+ Running here. It’s my favorite running app – but only because it’s the running app I’ve used for two years to track every run. 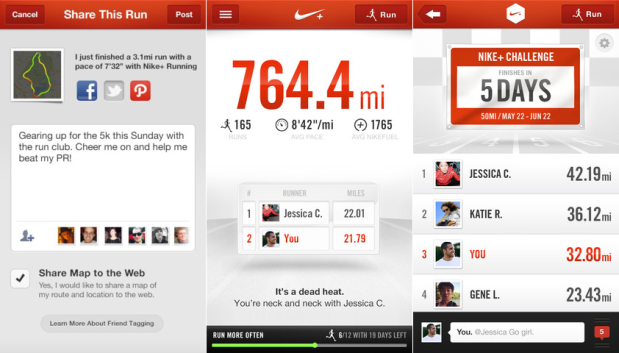 You can read my full Nike+ Running review here. If you don’t own any Nike products, then that’s okay. I don’t either, and you can still enjoy features like songs that match your run time, distance, and speed (power song to end your run? Yes please!). The app also monitors your weather and tracks how many miles you’ve clocked on your shoes to help you decide when to buy a new pair. There are lots more cool features to discover, but if you’re looking for a great running app with GPS support and long-time run tracking, Nike+ Running is a good choice. And, unlike other branded app, it doesn’t overwhelm you with Nike advertisements or other spam. Map My Run is very similar to the two top apps in this niche, but it doesn’t quite have as many features. However, Map My Run does have the unique ability to track your nutrition with your runs. So if you had a really bad run today, you can see what you eat and optimize your diet based on your running ability. Most people won’t do that, but if you’re the type of person who cares about nutrition and wants to feel accountable for the eating choices they’ve made, then Map My Run is a good choice. And of course, like the other apps listed here, Map My Run maps your run, tracks your route, and lets you add friends and compete with them. Endomondo calls itself a “sports tracker” instead of a pure running app. That just means you can track your running, cycling, swimming, and even weight training. It’s a hybrid personal training app/running app and it’s very popular among fitness enthusiasts. Endomondo features include all of the features mentioned with other running apps – route tracking, social run sharing, distance and speed, etc. But Endomondo is the only popular running app that acknowledges you have a workout routine outside of running. With Endomondo, users can enter run information alongside weight lighting information and other data. You can view the number of training days and training sessions you’ve had using an easy calendar. 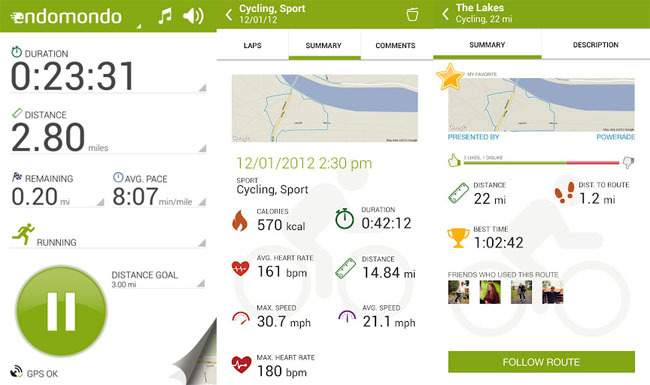 Endomondo also has a Facebook-like ‘news feed’ scrolling along your screen that features updates from friends. So if you’re the type of person who likes to talk about running with friends, Endomondo has an excellent social experience. 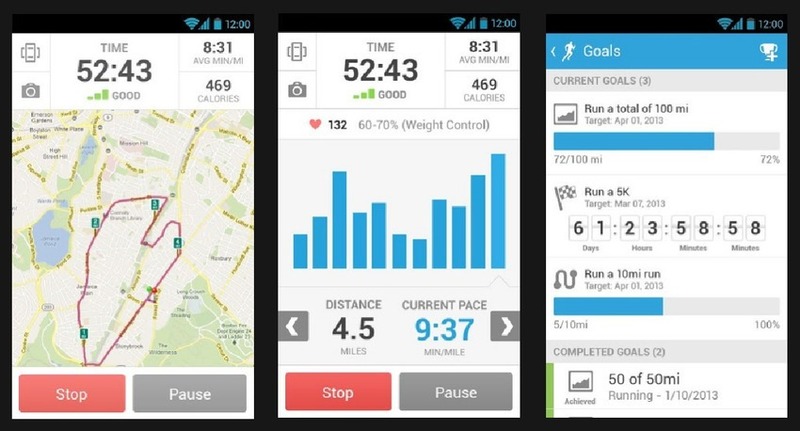 The first four apps on our list are very similar: they track your run, map your route, make you feel good about how far you’ve run, etc. Zombies, Run! is different. Zombies, Run! is “a running game and audio adventure”. It’s the only app listed here that isn’t free ($1.99 and $3.99 versions available) but many runners will find the price worth it. Zombies, Run! 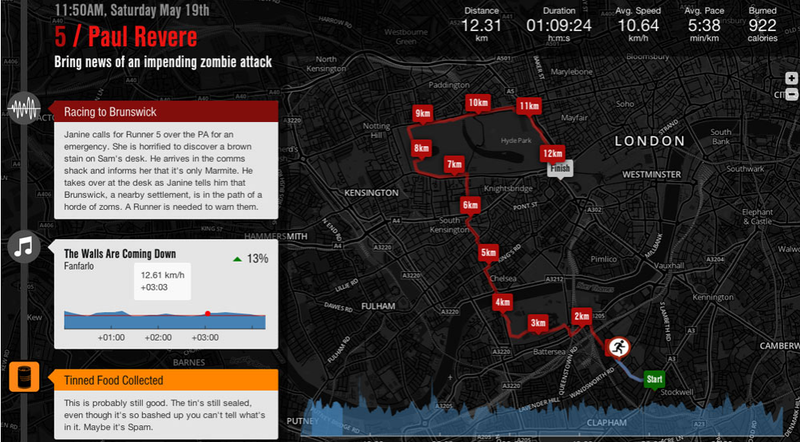 Inputs zombie-related information through your headphones. Zombies are chasing you and you can run around your time collecting various rewards and supplies. Basically, it’s like running around inside a zombie video game. If you don’t run far enough or fast enough, you will die to the horrific sounds of zombies growling in your ear. There are over 160 “gripping missions” in total and it works whether you’re running outside or at the gym. Are there other good running apps out there? Share them below! If they’re not pieces of garbage, then I might add them to the list!